The Kansas City Chiefs have soared to new heights in the first half of the 2018 NFL season. The obvious difference is the insertion of Patrick Mahomes as the starting quarterback. Mahomes gives the offense an added element of big play potential with his knack for creating big plays when the scheme breaks down. However, that’s not all he could do; Mahomes has been exceptional within the structure of the Chiefs offense as well. Let&apos;s take a look at their opening drive versus the Bengals in Week 7 to illustrate. The Andy Reid coaching tree that includes Doug Pederson (Eagles) and Matt Nagy (Bears), has had consistent success with their opening scripts in each game. Often times they will feature unique formations or concepts opposing defenses haven’t seen on film and run them in succession. Other times they will hammer a couple main concepts as they saw the opposing defense struggle defending it on film. They would present their concepts in different formations and with motions to prevent defense from realizing they are repeating calls. Only once the series is over will the opposing defensive staff have a chance to go over what happened with their guys on the field. No down lineman will have a free path to the quarterback if he chooses to throw. The blocking scheme closely resembles a more aggressive half-man, half slide pass protection. The play does not involve a quarterback run. The quarterback will read the backside linebacker in the box to determine hand off or throw. The Bengals play zone and expand two defenders to the stick combination. This indicates to Mahomes to hand the ball off. The right guard helps too much to the inside and allows the slanting end to get in the backfield. Kareem Hunt uses a nice spin move to escape and pick up positive yards. Mahomes makes a nice read and keeps the ball to pick up the first down. The defense gets 3-over-3 on the slant/flat side, which indicates a handoff for Mahomes. The Chiefs design the play to leave the corner unblocked. With a back like Kareem Hunt, this matchup favors the Chiefs. The corner cannot bring down a spinning Kareem Hunt, and Hunt shows off a bit more with the hurdle to cap off a tremendous run. Mahomes ran plenty of RPO’s in college and reads them well. 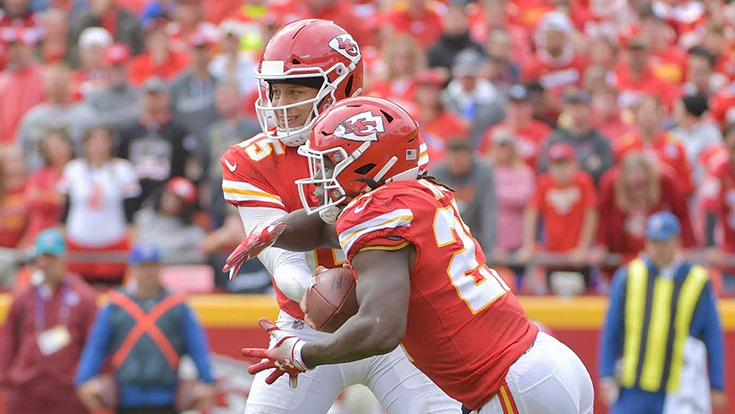 Andy Reid and staff are using them to help get lighter box counts for Kareem Hunt, and to get their talented wide receivers and tight end the ball in space. Start your free trial of Coaches’ Notes or Coaching OnDemand and access thousands of materials while learning from some of the best coaches from all levels of football.